Looking for the best veg catering services in Chennai? Well, we bought you the Best Caterer's Services for any events and functions. Gets high-quality catering service for Vegetarian food items. Experience an event like you've never imagined with outstanding food from the top Caterers. Contact The Best Catering Service in Chennai. Personalized Catering Services for Corporate event. Services: •	Corporate Caterers •	Wedding Caterers •	Caterers for Housewarming •	Outdoor Catering •	Small Party Catering Experience an event as you've never imagined with outstanding food from the top Caterers. Gets High-Quality Catering Service for both Vegetarian food items. 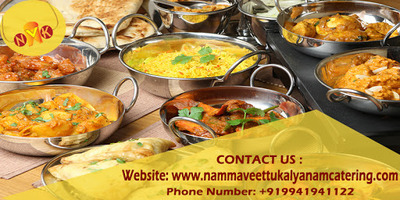 More Details Contact Us: Website: http://www.nammaveettukalyanamcatering.com/ Service: www.nammaveettukalyanamcatering.com/service Phone Number: +919941941122, +919841181122 Mail ID: nammaveettukalyanam@yahoo.com Let’s mark your event the sweetest journey by joining our hands at your convenient time to welcome your guest with complete humbleness and respect with our delicious food servicing.